Don’t we just love dinosaurs? Big, bizarre and scary, with impossible names from a land far away and long ago. Unlike, say dragons and unicorns, they are also real. Children don’t need to ‘believe’ in dinosaurs to find them fun. As monsters they make great toys, and as we grow up we find there is fascinating science emerging from their study. It wasn’t always like this. When I was a boy in the sixties the word ‘geek’ had not yet been coined for the sort of seven year old who borrows adult books about fossils and palaeontology out of the library. The dinosaur was not mainstream. There were no cuddly brontosaurus’ for toddlers, no dino colouring books and only a few plastic kits from Aurora when I wanted a model. Far fewer species were known, and these were the stereotypes; Triceratops, Stegosaurus, Tyrannosaurus and so on. They were cold-blooded, stupid reptiles who turned up as stop-motion monsters in films like One Million Years BC. Experts could only guess why such successful animals that had dominated the planet for 160 million years became extinct 65 million years ago. My local museum in Rotherham had no dino bones, so the Natural History Museum in London became a shrine I dreamed of visiting. Gradually dinosaurs came out of museums and universities to become public property. A new age of dinosaurs saw children’s books, toys, games, cartoon characters, dino-shaped biscuits and jellies take over the world. Oddly it made their study seem less grown-up, as if we were indeed researching dragons and unicorns. During the 1970’s scientists made great leaps in our understanding of these beasts. A massive asteroid impact was proposed as the ‘smoking gun’ which explains the extinction. Study of their skeletons showed some dinosaurs were warm-blooded, then that ‘theropod’ dinosaurs were the ancestors of birds. Many new species included fast-moving small predators like Velociraptor, dinos with feathers and some that lived in trees. Studies are now being made of their blood supply, digestion and running speeds. Species have been found nesting like birds, laying eggs, hunting in packs, migrating in herds and we can work out what colours some of them were. For a dino-geek, all this is really exciting. So finally, in 2006, I took a post in a museum. And as luck would have it, Guernsey has no dinosaurs. Not one. A couple of bones and other fossils have come into the collections from elsewhere, but a lonely tooth from an extinct species of elephant is our most ancient creature we have from the island . It is not because we don’t have old rocks – some outcrops at Jerbourg are up to 2,600 million years old, almost half the age of the Earth. All our major rocks have fiery origins, formed deep in the earth and later pushed up to the surface. The youngest of these are about 550 million years old and formed before there was any life on land. Above them, once upon a time, would have been deposited layers of sedimentary rocks such as sandstones or limestones including some dating to the time of the dinosaurs. These have all been eroded away by wind and water. If we ever had dinosaurs walking over our heads, the evidence is long gone. So, I’m still dinosaur hunting whenever I can, but I have to travel to places like the tiny Mormon town of Blanding, Utah whose dinosaur museum I visited in 2012. 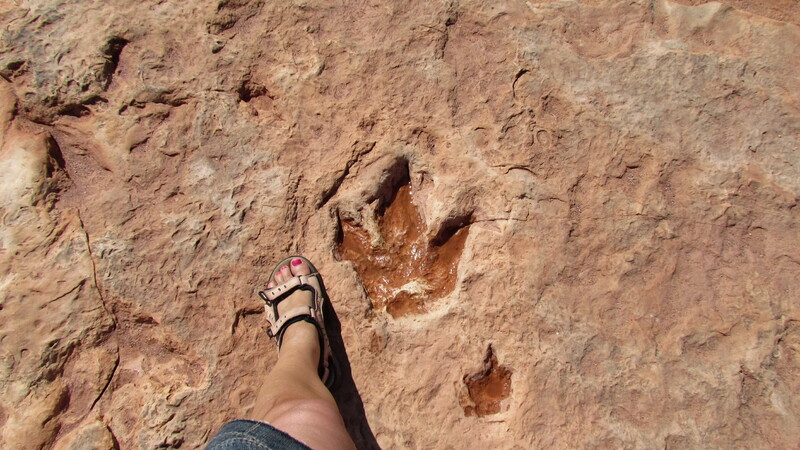 Out in the desert, in killing heat, a young Navajo woman guided my wife and I across sandstone beds where dinosaur tracks run for mile after mile and there are loose bones scattered on the surface as we would find shells on our beaches. Meanwhile, a body of experts insist that as aves (birds) is a group of theropod dinosaurs, the dinosaur is technically not extinct at all. Perhaps the closest a Guernsey Museum visitor will come to dinosaurs is that robin hunting through the flowerbeds outside. ‘Guernsey has no dinosaurs’? Have you seen our States lately?